Many experts are saying that Connected Car is the part of the giant internet of things. The automotive industry has the potential to become an IOT champion among other industries and fuel the IOT cloud services adoption among car owners and walkers alike. A connected smart car comes as a revolutionary way to drive and stay in touch with the world around at the same time. Connected car features divided into several categories, safety, navigation, infotainment, diagnostics and payments. Innovations to be introduced until 2020 include the full integration of smartphone applications, such as the linkage of the smartphone calendar, displaying it on the car’s windshield and automatic address searches in the navigation system for calendar entries. In the longer term, navigation systems will be integrated in the windshield and through augmented reality project digital information, like alerts and traffic information, onto real images from the driver’s perspective. Near-term innovations regarding Vehicle Relationship Management (VRM) entail advanced remote services, such as GPS tracking and personalized usage restrictions. Further, maintenance services like over-the-air tune-ups, requiring the collaboration of car dealers, OEMs and service centres, are under development. 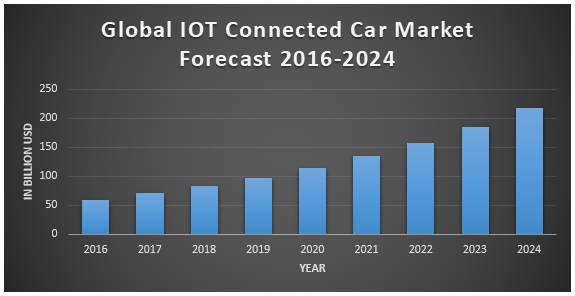 Global IoT Market Connected Cars growth forecast is as depicted in the below graph. Maximize Market Research has comprehensively analysed Global IoT Market Connected Cars. The driving forces as well as considerable restraints have been explained in depth to attain a balanced scenario. Segment wise market size and market share during the forecast years is duly addressed to portray the probable picture of this exuberant industry. The competitive landscape comprising of key innovators, service providers, market giants as well as niche players is studied and analysed extensively with respect to their strengths, weaknesses as well as value addition prospects. Report presents significant case studies along with the success stories to motivate and guide the like minds. In addition, Report displays current consolidation trends with respect to prominent mergers and acquisitions, consequent Market fragmentation, new trends and dynamics in partnerships, emerging business models. This will enable the reader to comprehend whole IoT Ecosystem with utmost ease and clarity. Global IoT Market in Connected Cars Analysis and Forecast 2024.